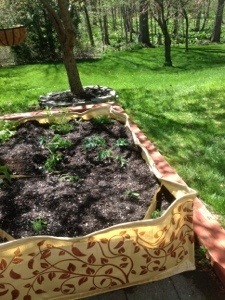 Edible gardening in southern Saratoga County. 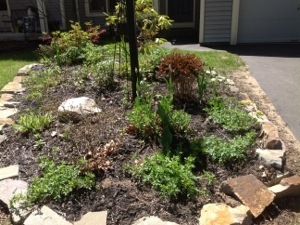 Last year I had the privilege of designing and installing a habitat garden in Clifton Park, NY, and this week the same client and I worked together to create an edible garden on their southern Saratoga county property. 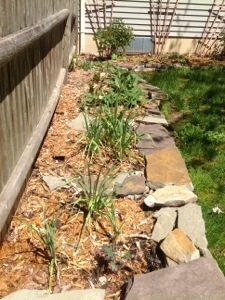 During installation of the habitat garden last year we had included some garlic in the side bed, partially to discourage browsing on new plants top growth, and partially to give the residents the opportunity to eat delicious, freshly harvested garlic and olive oil over pasta. In the standard, non-permanent raised bed that we filled with excellent quality organic soil, we used companion planting strategy which includes pungent organic herbs and Nasturtium seeds. Nasturtium is a work horse in the edible garden; pest insects don’t like it’s odor and are naturally repelled, meanwhile predator or beneficial insects are attracted and gobble up stray pests. In the fall we had cut down the non-native Lilac tree and replaced it with native species Silphium perfoliatum or Cup Plant- which has an assertive growth pattern. One never needs to feel guilty about using Cup Plant as a cut flower because it can spread from seed with extreme ease. We had treated the Lilac, as classic organic gardening method would suggest, with white vinegar to kill the non-native plant’s roots energy. Though it stifled growth considerably, we can now see the Lilac fighting for it’s life, sending out buds and water sprouts. 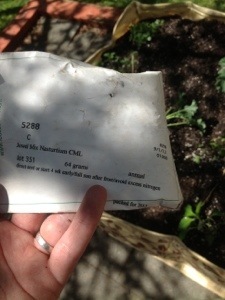 Epsom Salt may be the next organic gardening tool we pull out of our arsenal for stifling Lilac. 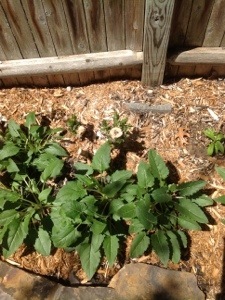 A partial shade garden at the front of the property is going to pay dividends being adjascent to the backyard edible garden- this shady bed holds 6 Zizea aurea or Golden Alexanders. Golden Alexander is in the Goldenrod family and it is a host plant for the Black Swallowtail butterfly. It supports a lot of native insect life, many, many pollinators will be drawn into the micro-ecosystem, particularly native bees. This additional pollinator carrying capacity will add muscle to our edible gardening effort in southern Saratoga county: it will result in larger and better formed tomatoes, peppers, zucchinis, eggplants, cucumbers, melons, squash and any other open pollinated plant.